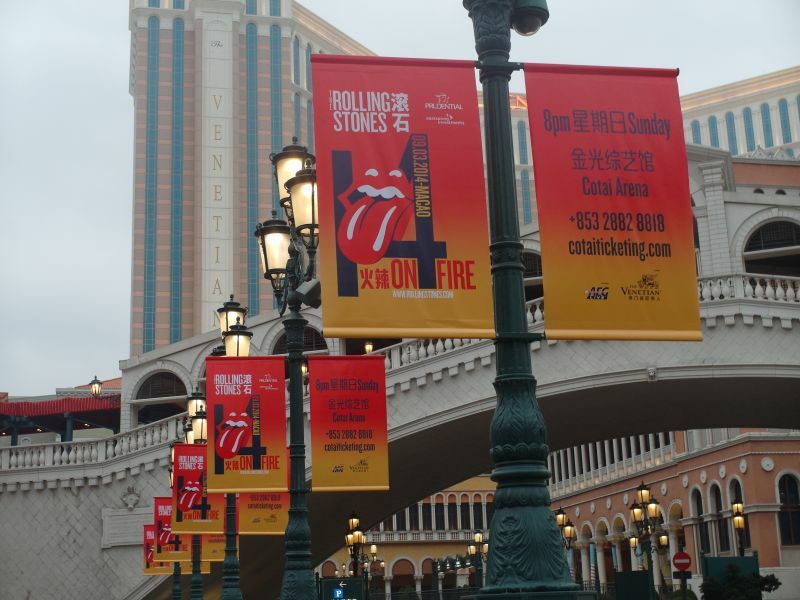 This thread is for live updates and comments regarding the Rolling Stones Macau China show on Sunday March 9, 2014. Please tell us your pre- and post-show thoughts and comments here. The show is expected to start shortly after 8pm. Macau is 7 hours ahead of Central Europe, 8 hours ahead of UK and 13 hours ahead of US East coast. P.s anyone flying into/out of Macau look out the left window of your plane to see the stones plane parked up in full view. Edited 1 time(s). Last edit at 2014-03-09 10:09 by petewasbristol. First arena show, hope they brought the full tongue pit stage with them! To those who are going. Be safe and have a great time!!! Have a great show at Macau everyone !!! One hour till doors open at 7 pm (according to the ticket desk). While waiting until the show begins, you can do a walk around 'The Venetian' in Macau via Google Streetview. Owning one of those flags would be cool. Have a brilliantly glamorous time! Have a GOOD one and Enjoy IT!! Greetings all the way from Sweden. Edited 1 time(s). Last edit at 2014-03-09 13:27 by rollingon. This would be my 19th time I attend a Rolling Stones Live concert (through a thread in a discussion board... ). I still remember my first live Stones FORUM concert... It was in London 2012. I paid some 6.4 Megabits through some 65 refresh keyboard pressings. I still recall how, just after the 7th time I pressed the F5 key, my favorite Gimme Shelter was reported to be played through twitter. "Catwalk too high in the pictures"
"MT not enough what a shame"
"What are the Merch prices?" wroclaw, these forum concerts are fun! I will be teleporting shortly to this luxurious event. Edited 1 time(s). Last edit at 2014-03-09 14:06 by Irix. Tell 'em to keep their nose on their own face. Edited 1 time(s). Last edit at 2014-03-09 14:06 by MingSubu. They left the Tongue Lip..? Edited 1 time(s). Last edit at 2014-03-09 14:07 by Stonesfan2146. I vote for an abolishment of timezones! wow.. that's a nice setting! Enjoy Irix! So glad the tongue stage is baacckkk!! !